Thanks so much to my sweet friend, Laura, from Top This Top That for including me in a fun "Better Late than Never" Fall gathering! 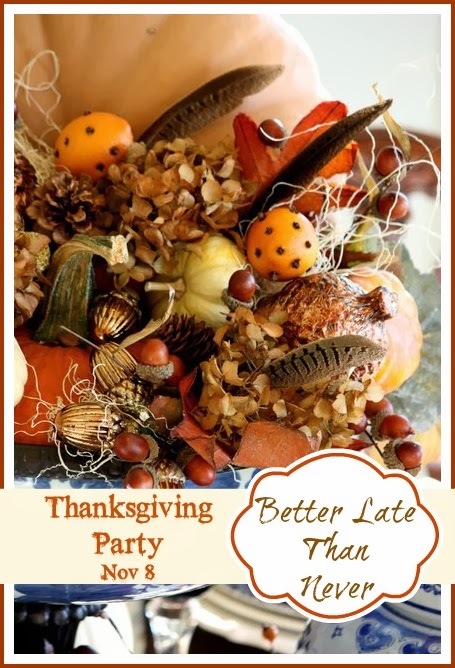 Will you be hosting Thanksgiving this year? While I'll be cooking a few staple holiday goodies for the upcoming day of thanks, we won't be dining in our breakfast area. 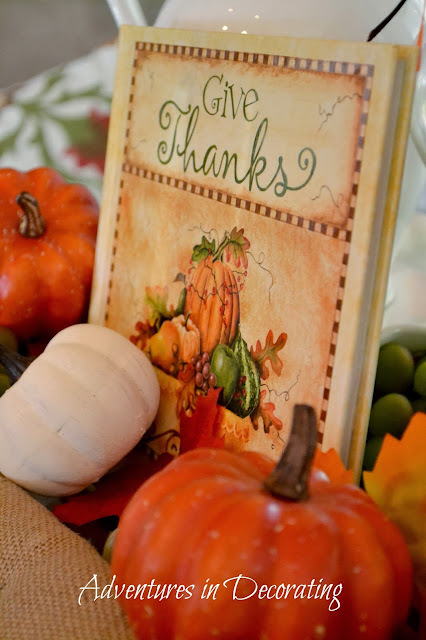 along with a book of thanks reminding us what Fall is all about. Over on our dry bar (which, by the way, I STILL love in its shade of Annie Sloane's "Chateaux Grey"), I would've gladly moved our Fall pieces out of the way to make room for all things carbs! Yes, this glass cloche filled with tiny pumpkins nestled in between corks and pinecones, could easily have been "scooched" on over to make room for the loaded mashed potatoes! Mr. Roo (and his surrounding Fall picks and oversized acorns) would gladly have made room for the turkey! 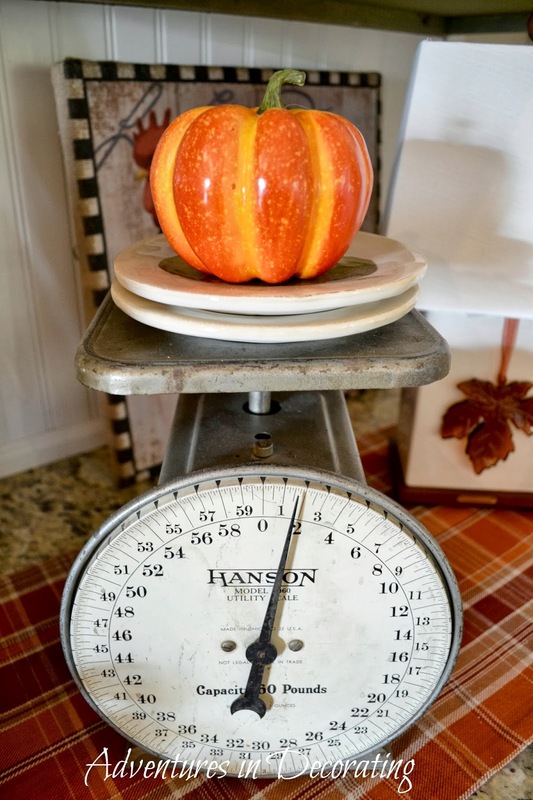 And, um, WHO wants to even *see* a scale on Thanksgiving, right? Pumpkin and apple pies would be much easier on the eyes! Another reason why it's probably a good thing that we're not eating our Thanksgiving meal at this table is because, well, it doesn't quite look like this anymore. Oh, and before I go … IF, by chance, you have a double pedestal antique table that you'll be seating guests at in a few weeks, make sure you check your legs (to the table, that is) to make sure that one of them isn't loose or cracked. 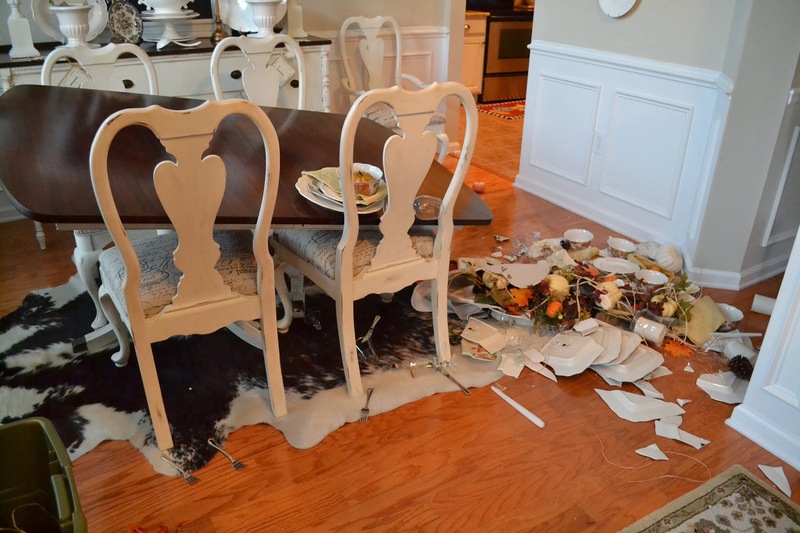 I'd hate for you to be greeted by this lovely scene that I experienced in our dining room last week … oops! Thank goodness, I somehow managed to laugh and not cry! LOL! 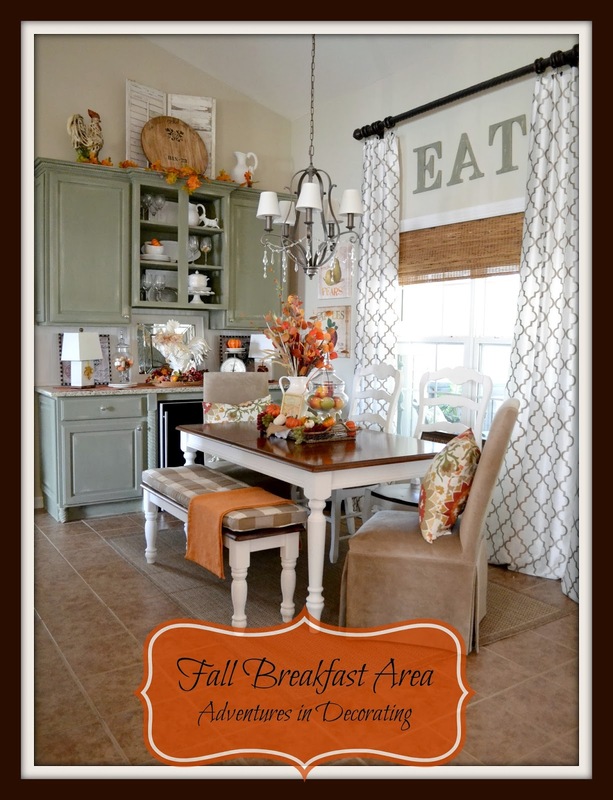 Thanks so much for visiting our Fall breakfast area! Be sure and pop on over and visit these incredibly talented ladies who are sharing their Fall spaces, too! That is terrible! I definitely would have cried! Your breakfast area looks delightful though! Becca, your Fall home is stunning! You always have a splendidly decorated holiday home. The splashes of orange are so pretty with your white decor! I'm so sorry about the pedestal table leg breaking! What a shock! I checked mine after I saw this. What a lesson for all of us! I do hope it can be repaired. Becca, that last picture is amazing...got my attention! You have to laugh at the crazy stuff that happens in life, right? I can tell by what I saw on the floor that it was a beautiful table setting. I love your attitude! Thanks for reminding us that being with family and loved ones on Thanksgiving is what's really important. So happy to be joining in this party with you. Your home is beautiful, as are you! Everything looks beautiful, Becca! I love the height you've added to your dry bar area with the things on the top of the cabinet. I also like the corks mixed in with the Fall filler. Lots of textures going on there and the corks work well with it. My daughter has taken to hosting Thanksgiving since we all moved to Ohio from NY, which has been nice. 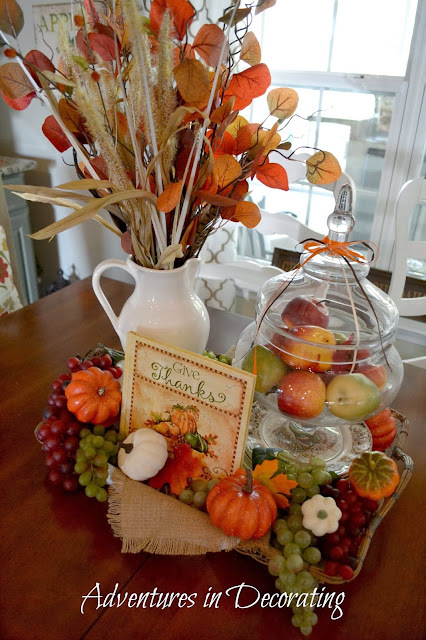 Oh I so love seeing that gorgeous breakfast area dressed up for the various seasons…you are a magician Becca…I saw your "disaster" on FB, but knowing you…you took it in stride and laughed it off with that beautiful smile of yours!….Have a wonderful weekend Becca!!! Oh my gosh Becca I would have cried...how terrible!! On a happier note your breakfast room looks BEAUTIFUL!! I still cringe when I see our poor dishes etc. splattered all over your beautiful floors! Checking my pedestal leg for sure! Best tip! What a beautiful and magazine worthy breakfast room. Can't wait to see it all decked out for Christmas! Oh Becca, I am so sorry your table fell over, I think I WOULD have cried!!! Beautiful post, can't believe you are decorating for Christmas already. Good for you!!!! I don't know why I don't get your FB feeds???? Have a great weekend, Becca! Oh, I still feel so badly about your dining room table and of your broken dishes.....sniff, sniff. 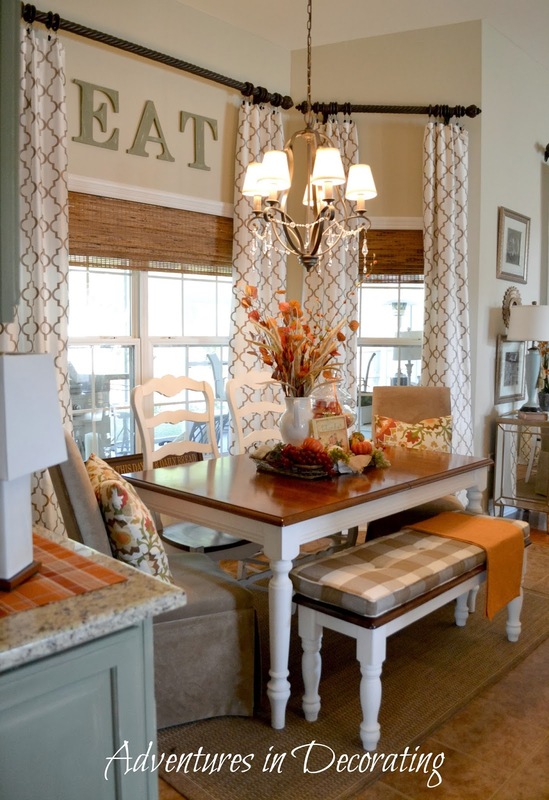 Your breakfast room looks beautiful, of course! We don't have Thanksgiving at our home either. Our son has declared that preparing Thanksgiving food is his favorite. After almost 45 years of preparing turkeys, I am happy to retire my baster! I am still crying over the spilled milk...opps I mean dishes. Your a doll for partying with me and as always your decor is beautiful...even if we aren't sitting there for thanksgiving. Oh no! That is just terrible your table leg broke and I see broken dishes all over the place! Well, you're a good one to laugh and not cry! I love your home and you really do know how to decorate. Be careful as you walk around in your tiny bare feet - those little shards of glass go everywhere! Oh no!!! You're a good sport Becca! I'm pretty sure I would've cried initially, and then I would've gotten over it. Oh my once that happened to me with my kitchen table full of drinks and Italian food. I feel for you. Oh Becca, so sorry about your table! I have come upon the same sort of disaster before, but at the hand of naughty kitties :( The rest of your home is just gorgeous though! I'm enjoying everyone's Thanksgiving decor, we have a magazine shoot here the day before Thanksgiving, for SPRING. So no pumpkins here any more, just pink flowers and bunnies :) It's crazytown right now. Can't wait to see your Christmas, woohoo!! Have a good weekend, xoxoxo!! Beautiful Fall breakfast room Becca. But I am crying and cringing for you about the broken table and all your pretty things that broke when they fell. So sorry about the table mishap! I'm not sure I would decorate that table again. So sorry your table broke and all those dishes too...awful! 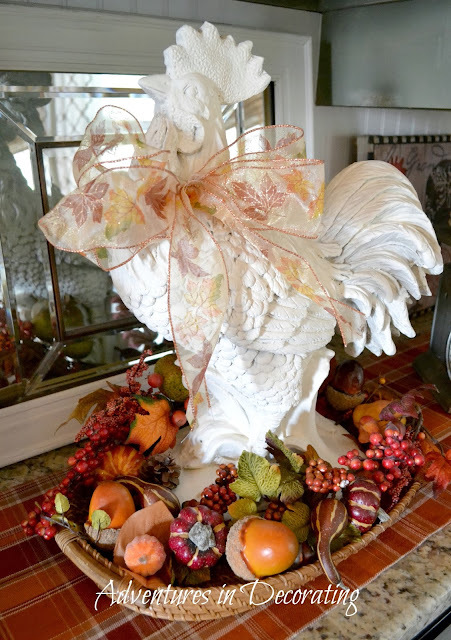 Your Fall decor looks wonderful! well, forevermore =( Hate that your table went kaput. I sure you'll have a lovely replacement though. I love your breakfast area and especially how you decorated it. And to lose those lovely pieces I would have sat down and cried!! Although it would have been worse if it had been laden with food and your guests were sitting down with a lap full of food :-( I'm checking our table before the family arrives!! OMG!! I would have been having a fit! Then, I would have laughed to keep from crying! Well, now, you have an excuse to buy new stuff...lol!! Your breakfast area looks great! You never disappoint! 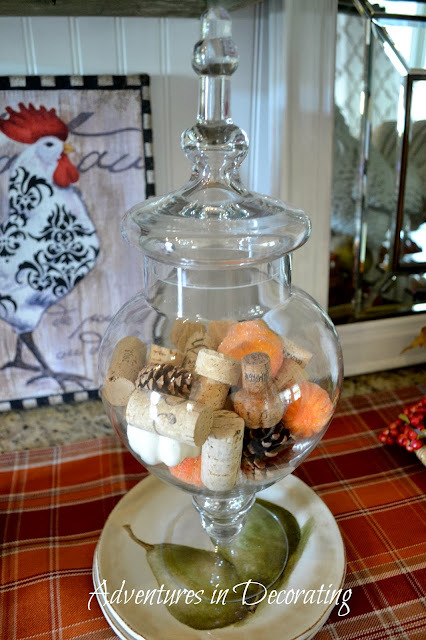 I love the use of pinecones and corks in your glass coche. How clever. Oh gosh Becca! That's awful about your table! I've find bolts on the floor, but they are from the chairs. Your breakfast table looks warm and welcoming. Can't wait to see it dressed for Christmas. 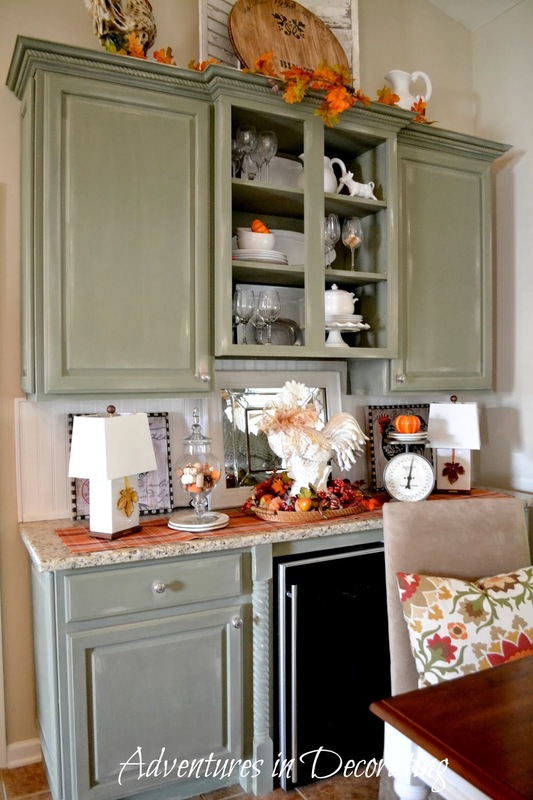 I LOVE your style ,dining area,cabinet color & accessories! You give new young bloggers like myself inspiration! I feel terrible about your table. Bless you for keeping your humor and having the gravitas to grab your camera at a time like this (I love the rooster with the fall bow around his neck by the way). Oh my gosh, I am headed home to check my dining table. That would make me cry. Your home is beautiful. Ooooh what a mess!!! Hopefully there wasn't any food in all that mess. Really sometimes all you can do is have laugh! I just found your blog and love it! My home is very similar in style and colors, so this is very exciting. Oh my! I probably would have been in too much shock to do anything other than stare. I hope it can be fixed! Wow. That had to be a shock. All that beautiful china. Beautiful room. Where did you get the long cushion for the bench? Where are the curtains from? I have been trying to find them everywhere.